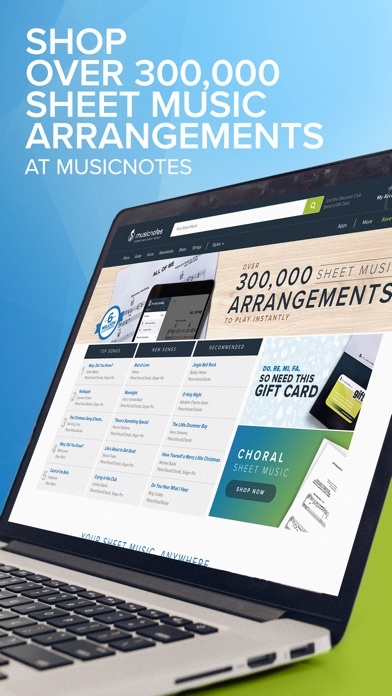 All of your sheet music purchased from Musicnotes can be accessed anywhere from our free mobile and desktop apps. Easily browse over 300,000 Musicnotesâ€™ arrangements. NEW! Purchase your perfect arrangement in-app. Or, add to your wish list to purchase later on-site. Each purchase includes 1 print and unlimited lifetime access in-app. Play all your Musicnotes sheet music, whether you bought on-site or in-app. THE PLAYBACK TOOL: Bring your sheet music to life. Selectively mute or adjust the volume of separate instruments and parts. THE TRANSPOSE TOOL: Change key on the fly. Choose the key that fits your musical style. Easily switch keys at any time to any of our available professionally-created transpositions. THE MARKUP TOOL: Easy annotation. Mark it, then play it. Built-in pen, highlighter, and type tools. Markup Options can show all annotations at once or hide a select few. Print your Musicnotes sheet music from any connected AirPrint Printer. Connect your Dropbox account to easily add sheet music PDFs to your library. If you prefer, you can still connect your device to iTunes and import PDFs you have on your computer. Sync and organize all of your Folders and Set Lists between your iOS devices. Enjoy 10% off website purchases and $1 off songs in-app. The Musicnotes Pro - Standard add-on is an annual subscription that will charge a payment of $9.99 USD to your iTunes Account and auto-renew unless auto-renew is turned off at least 24-hours before the end of the current period. Your iTunes Account will be charged within 24-hours prior to the end of the current period. Your subscription and auto-renewal may be managed and/or turned off in your Account Settings. (Note: PDF support is limited to display, markup and folders/set lists. Even though it would be cool, we do not magically make them into fully interactive Musicnotes files).